Understanding how, and when to use an automated external defibrillator (AED) can empower you to save a life. That's why the American Red Cross offers AED classes in Santa Rosa and across the country. With the option to learn online, in person or take a blended Simulation Learning class, which combines online coursework with hands-on skills sessions, you can be prepared to deliver care when it's needed most. At the American Red Cross, AED classes in Santa Rosa can give you the knowledge and confidence to help someone in a time of crisis. Delivered in a traditional classroom setting, with lecture and hands-on skills training, our AED courses allow you to become familiar with the technology, ask questions, and learn in a supportive environment. Red Cross AED classes in Santa Rosa are designed and taught by experts who can help you learn to provide care during times of crisis. Our courses are not only OSHA compliant, but they're also fast, easy, informative and affordable. And when you choose the in-person or blended Simulation Learning courses, you'll receive full certification that's valid for two years. This can help satisfy your employer's safety requirements and make you an even more valuable member of your team. The Red Cross not only offers Santa Rosa AED classes for individuals, but we also deliver industry-leading AED training for those who work in healthcare. Whether you're a first-responder, CNA, nurse or doctor, our training opportunities allow you to learn the latest information and proven techniques. 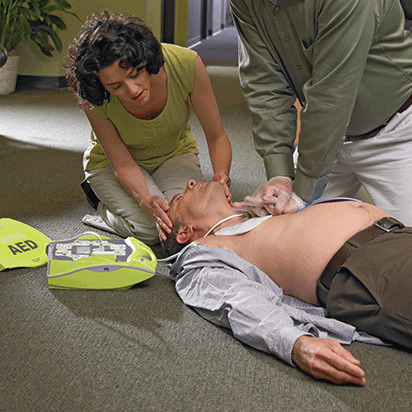 At the Red Cross, we offer AED training in Santa Rosa for students and administrators. Through our special schools program, your faculty and students can learn how to properly use an AED, and be ready to help when every moment counts. School courses result in full two-year certification, and all participants will have access to our online refresher materials, which can help keep their skills sharp long after their AED training has ended. In order to give you the information you need to provide care to someone in need, our Santa Rosa AED classes also include instruction on, and certification in, First Aid and CPR . And although these classes offer a wide range of information, they take just a few short hours to complete. In addition, our in-person and Simulation Learning courses on AED, First Aid and CPR are OSHA compliant and result in full certification, which is valid for two years. If you don't often use the skills you've learned in our AED classes in Santa Rosa, it's easy to forget how and when to use an automated external defibrillator. In order to keep your memory fresh, we've created a printable document that outlines the steps necessary for providing life-saving care. This way, you can keep the instructions in a binder, on your refrigerator, at your desk or in your bag, and refer to them from time to time so that you're ready to help when it's needed most. The Red Cross offers AED classes in Santa Rosa throughout the year, and at a wide variety of convenient times and locations. This way, you can find the training you need at a time that suits your schedule. Taught by experts in the field, our training classes can help you gain the skills needed to help, and make a difference when every second counts.